Variable Speed polisher review will help you make the right decision. Variable speed polisher is really a generalization for numerous types of car buffers and polishers. From orbital to rotary, picking the best polisher will be about matching up your world to the buffer that best meets your needs. Unfortunately many of us are left to make decisions with partial information and find ourselves disappointed after the fact. Often we find ourselves lacking enough experience or knowledge to even ask the right questions in the first place. Finding a top rated car polisher that fits your world will not only affect your polishing effectiveness, but greatly affect whether you are even willing to use the tool or not! The good news is that today, you have numerous choices of truly quality buffers and polishers. The bad news is that this will make the decision process that much more difficult. We will dissect the numerous variable speed polishers to see which one rises to the top and becomes your top pick of a quality car polisher. Generally when people refer to a variable speed buffer or polisher, they are usually referring to what is traditionally called a rotary, high-speed, or circular polisher. These types of buffers have been around the longest and represent the widest spread of abilities, speeds, and performance. It is also an area of surface car care that is filled with really bad information, and endless stories of burned paint edges, swirl marks, or holograms. These stories circulate in all areas of life and they make for really good headlines. Unfortunately, all this bad press prevents many from understanding just how useful these types of polishers can be in the right hands! They allow a person to do what I call the heavy lifting of paint correction and car polishing in general. But just like the proverbial gun debate, buffers don't kill paint; people kill paint! 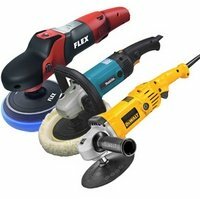 why a top rated variable speed polisher? The only real tool that will allow you to perform heavy duty gel coat/fiberglass polishing and restoration. Can literally reduce the heavy duty polishing to a fraction of the time as compared to trying to perform the heavy lifting with a DA (dual-action), or random orbital car polisher. Circulates on a single axis point which allows for precision polishing along fine lines, character lines, or "details" of car paint. The only drawback in my opinion is the learning curve associated with these types of car polishers. You trying to get over all the bad press these types of buffers get. Based on the simple list above; the pros certainly out-weigh the cons. But I get it....all those damned horror stories of burned edges, swirl marks, or car paint damage in general! "With the newest generation of variable high-speed car polishers and their super-low operating speeds, they can be as safe as any dual action, random orbital car polisher. It's just very few people are letting you know it." 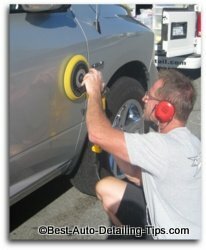 Because the industry itself has responded by building some incredibly amazing dual action, orbital car polishers, most guys are easily seduced into buying one of these random orbital buffers, and never realize how much time they could be saving themselves if they take the time to learn how to use a rotary polisher. They all perform, and do so brilliantly. If you are of the opinion that German engineering means something different and are willing to pay for it, then the Flex is for you. If you want to save a few bucks then simply shop the cheapest of the bunch, and you will still be delighted. The Flex is the lightest and quietest of the bunch. I hope this has helped open your eyes with greater understanding with which you can now make a more informed decision!